Servicing the international marine industry, Ocean5 Naval Architects is a leader in providing technical services. The firm offers its diverse, global clientele with complete naval architectural services. The company draws upon its solid background, technical experience, and innovative thinking to deliver services for a diverse range of custom and production vessels in the private, commercial, and government sectors. Ocean5 Naval Architects was evaluating the design for installing a gyroscope into a large superyacht. A gyro is used to apply forces to a boat hull so that the boat is very stable while it is at sea. Depending on the sea state, the forces can be very large and the structure accepting these loads must be designed to withstand the forces over the life of the vessel. We have the software and expertise required to analyze complex structural problems like the gyro assembly, and we were more than happy to help. Solution Ocean5 did the right thing by asking Northern Lights Solutions, a specialist in structural simulation, to solve the complex analysis of the gyro assembly. 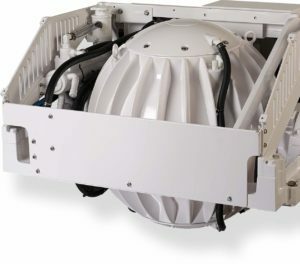 With the help of Ocean5 and the gyro’s supplier, NLS’s computer aided engineering (CAE) department was able to secure basic surface models and design parameters to develop an assembly model for the structural analysis. NLS chose to perform Finite Element Analysis (FEA) to solve the analysis since hand calculations would not provide the detail required to fully understand what was happening in the system. The assembly, as first proposed, did not satisfy the structural safety factor requirement, so NLS’s design engineering department looked at how the assembly could be changed to meet the requirement, and proposed design changes to Ocean5. 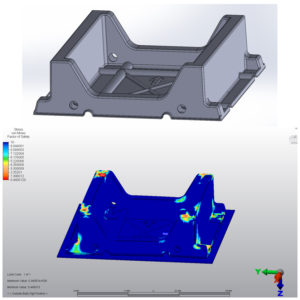 By using NLS to perform the complex structural analysis, Ocean5 was able to get fast results. Those results enabled the company to make design modifications quickly, and with very little associated cost. Ocean5 was able to confidently start production on the new design, which was a huge win for its bottom line.